The Mayor had just returned to his constituency in Ames, Iowa when we talked on the telephone. After playing and administrating in the NBA, he was back at Iowa State as the head coach, where it seemed he belonged all along. 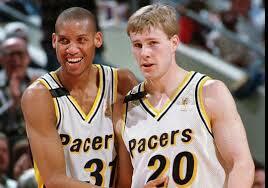 I covered Hoiberg during his Pacers playing career, which lasted four seasons. It was uneven, to say the least. Sometimes he looked like a great backup for Reggie Miller at shooting guard, other times he didn’t seem to belong in the league. He hit 41 percent of his three-pointers his second season, but just 1-of-9 in his fourth, when he seemed to lose confidence and played in just 12 games. What remained consistent was his relationship with Miller. The two were always close. Miller flew to speak at Hoiberg’s camp in Ames after Hoiberg’s rookie season, and allowed Hoiberg to offer suggestions during games. Hoiberg went on to productive playing careers for Chicago and Minnesota, despite a heart ailment that nearly killed him and required surgery. He played 10 seasons overall, with the peak coming his first two seasons in Chicago, when he averaged nine points. If his stats were erratic, his work ethic and attitude were not. He’s like someone out of a Disney movie from the 1950s, a clean-cut, polite, seemingly perfect human being. Wally Cleaver on hardwood, if you’re old enough to understand that one. It turned out Ames wasn’t where he belonged after all. At least in his mind. After a successful run as Iowa State’s coach, he’s back in Chicago to coach the Bulls. It will surprise nobody if he succeeds.